In one of the most popular images of Cleveland Jewish life in the early 1900s we see most of the nearly 200 members of Local 1750 United Brotherhood of Carpenters and Joiners assembled on the steps in front of Congregation Oheb Zedek at Scovill Avenue and East 38th Street. They were Jewish carpenters, whose banner displayed a Magen David symbol. It is Monday, September 4, 1911. 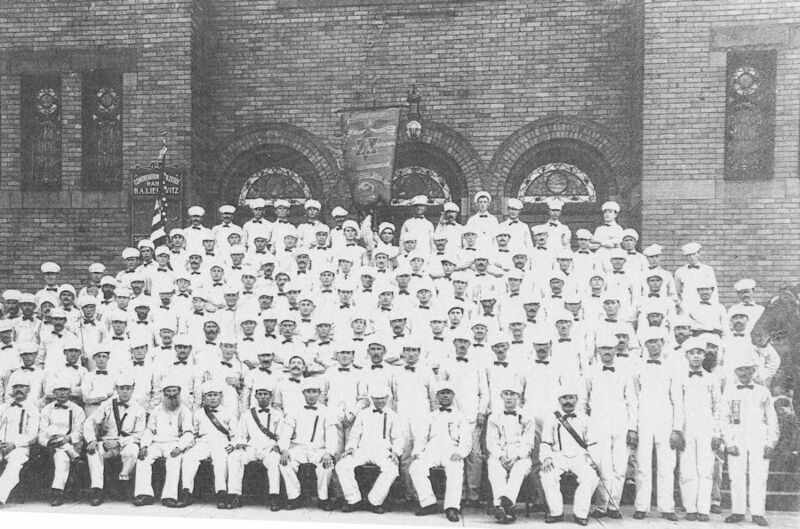 Wearing their white uniforms they would soon march with more than 10,000 other working men and women in the Labor Day parade. The headline in the Plain Dealer was "Marching Unions To Show Strength Labor Leaders Promise Biggest Parade in City's History on Monday". The reviewing stand would be at City Hall where there would be speeches in several languages. A picnic at Luna Park on Cleveland's east side would follow. Four months earlier the Jewish Carpenters Union had marched in the much smaller May Day parade, where the Plain Dealer headline was "Red Flags Fly As Socialists March Lead Procession of Cleveland Party in Celebration of May". These were times of unrest when workers were acting through their labor unions to achieve a larger share of the nation's growing prosperity. Read more about the Jewish Carpenters Union.